Is Surface Book Priced Right? Update: See my regression analysis on this here. Microsoft announced yesterday it is getting into laptop business with the introduction of its new Surface Book laptops. While it had hardware business before with Surface tablets, phones and watches this is a big move as they had so far left the laptop business to PC makers. Microsoft believes the Surface Book models are game changers in the hybrid laptop-tablet market. As Wired magazine called it, “this may be most exciting Windows laptop in years”. And to match that perception Microsoft has set premium prices for the models. The cheapest model starts at $1499 and Microsoft thinks you will be willing to pay almost double that when it doubles the capacity, memory and processor speed. With rich hardware specs and with performance that is 50% faster than Apple’s MacBook Pro, it may appear that the product deserves its high price tag. Product deserves its high price tag. And when you believe the product deserves its price the price is set by adding a markup to this high cost of building it rather than finding the price point that will drive demand then try to make the product at a cost that meets profit goals. To see this point of pricing inefficiency, let us place the Surface Book prices in the context of Apple’s MaxBook and iPad Pro prices. 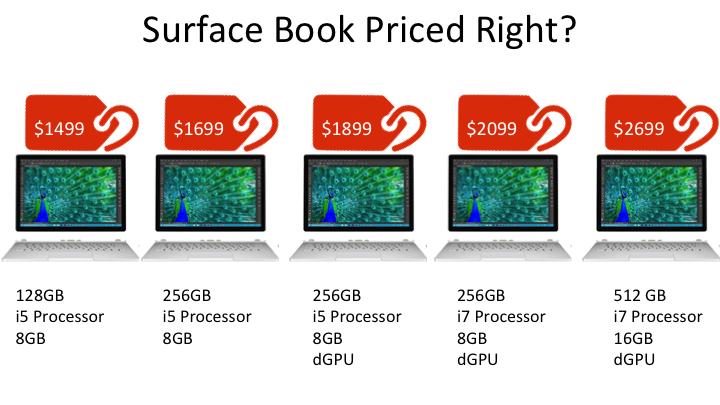 While the line up of just Surface Book prices may look logical it falls apart when you look in the context of choices available to customers. There are always choices to customers . In this case Microsoft wanted that choice to be between Apple and itself by comparing the specs. I added iPad Pro because those are now viable choices as well. The first thing to notice is how little Apple talks about performance in its pricing. The two features that are used to create value differences are – Screen size and Capacity. This pattern is repeated in not just laptops but across iPhones and iPads. With 100s of millions of these devices sold we must assume that variations in customers value perceptions can be explained to a great extent by just these two features. Take a look at the comparison chart. There are 9 options from Apple that are priced lower than the lowest priced Surface Book Pro. This means there is not enough reason for an Apple customer to switch and only a small portion of new customers may self-select to $1499 Surface Book. 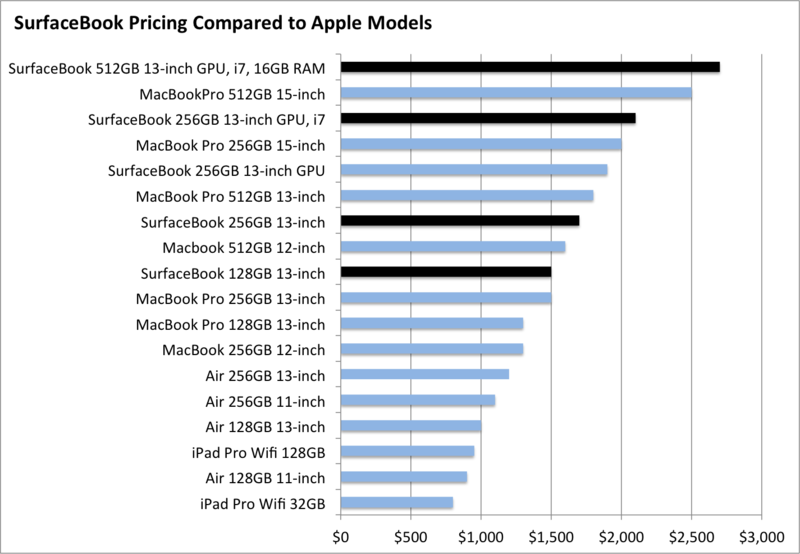 And for premium models, other MacBook Pro models deliver far more value on the two value dimensions (Capacity and Screen) than Surface Book premium models do. Have you heard of value waterfall? Microsoft Surface Book models may be priced right from a product view but not from customer view and definitely not priced to drive demand. ← Can I Make Book Recommendations? The points on channel discount is valid but overall I posit they built a product that is done from inside-out thinking than from customer driven outside-in thinking. Hence the wrong pricing.